Description: Bethel College Putnam math competition participants for the Dec. 1964 competition; left to right, Paul Harms (instructor), Elias Toubassi, Silas Law, Gary Lyndaker, Kenneth Graber, Donald Quiring, Arnold M. Wedel (professor). The team of Toubassi, Graber, and Quiring ranked 14th nationally. 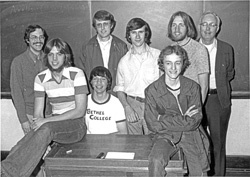 Description: Bethel College Putnam math competition participants for the Dec. 1976 competition; left to right standing, Richard Rempel (professor), Robert Neufeld (professor), Dan Flickinger, Joseph Ediger, Arnold M. Wedel (professor). Seated left to right, Dave Wiebe, Randall Goering, Andrew Rich. The team of Rich, Flickinger, and Ediger ranked 30th nationally. Rich as an individual ranked 61st nationally and 2nd in Kansas. Flickinger ranked 3rd in Kansas.